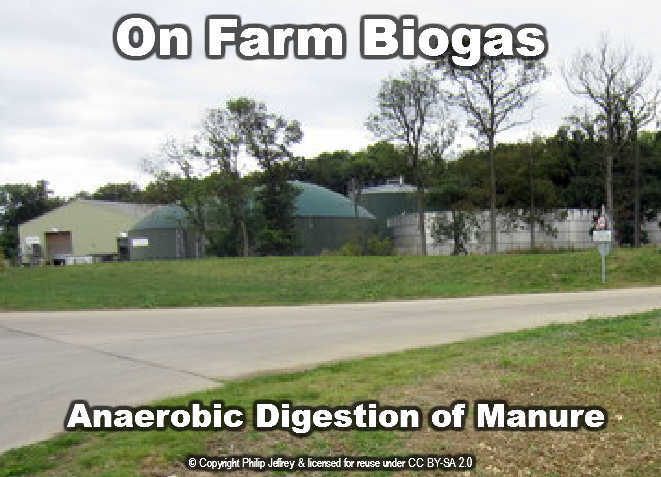 The anaerobic digestion of manure is the most common type of on farm anaerobic digestion, although there are an increasing number of on farm AD plants which also either grow and digest their own bio-energy crops, or import food waste, and other similar feed materials. The most basic manure digestion plants are low profile low cost and simple Anaerobic Digestion plants, usually found on dairy farms which accept the farm’s own manure. The facility would normally be expected to by owned and operated by the farmer/farm business, but on occasions may be part of a co-operative venture and in that case most are community funded or government aided. Frequently those plants that process only the waste produced on that farm, may avoid the more stringent regulation of larger plants where there is import of feed materials, and often would not be approved to accept Animal By-Products. The anaerobic digestion of manure/ farm slurries may be carried out as a joint venture between the members of a farming co-operative. In such cases the AD Plant will be located on one farm within the co-operative, and these biogas plants are called “Central” anaerobic digestion plants. These plants are larger and more complex than On Farm Anaerobic Digestion Plants. They will serve a number of livestock farms and usually be PPC Permitted by the environmental regulator. They will usually accept Animal By-Products wastes for digestion and be licensed by the state veterinary service to do so. Diagrams provided courtesy of DEFRA: Ref – AEAT/ENV/R/2104; Assessment of Methane Management and Recovery Options for Livestock Manures and Slurries. Report for: Sustainable Agriculture Strategy Division,Department for Environment Food and Rural Affairs,London SW1P 3JR. The Danish were the early leaders, with the Germans and Ducth, close to follow. In Denmark in 2008 there were over 20 centralised Anaerobic Digestion plants in operation and more than 60 farm scale Anaerobic Digestion in use. That figure will be much higher now. Technically these have been operating well we are told, and in 2008 many had been operating for more than 15 years. They are economically viable and most operate as co-digestion plants with slurries, in additional to food industry, brewing industry etc wastes. The farm manure slurries do not add a great deal of gas production, and accepting the sludges from the farm may be seen as more valuable as a disposal method for this wastewater which cannot be discharged to watercourses without treatment, than as a biogas and energy revenue creator. At the beginning of this page we said that the anaerobic digestion of manure may also include the use of energy crops specially grown to be used to create energy. In general we are against the large scale use of crops for this purpose, as it can displace food crops and raise the cost of food, and might even conceivably cause food shortages in the worst cases. However, the use of certain crops, as part of the feedstock used, can assist in efficient manure digestion, and some digester operators may also use parts of their crop as digester feedstock. This would otherwise go to waste and rot away in the fields. In such circumstances the use of energy/food crops can be a positive feature, and very acceptable. Enjoyed your article. We have our own system on our Dairy farm, 7 years now. Keep writing. I clicked on among the pictures on this web page however I obtained a mistake message. I suggest you examine that. I’d like to point out that biogas plants based on dairy manure only, have a bad reputation due to low biogas production per unit mass of manure and therefore a low return on investment. This is made worse by high capital investment and operational costs. In the US viable energy production and waste recycling from anaerobic digestion of manure is only possible if the facility is run on a combination of manure, co-digested with other higher yielding biomass materials. Creating your own green energy on the basis of your farm’s manure can put 5p in your pocket for every litre the farm produces. You also get independence from energy producers and distributors and the increasingly rising energy prices. All I have to say is CRAP.